When my mother remarried after thirteen years of being a widow, I had to move to a new town and enroll in a new school. Suddenly thrust into an entirely different kind of life, I just wanted to go home. I didn’t want to meet new people, didn’t want to leave my old friends, didn’t want to become a third wheel to my mom and her husband…and I really didn’t want to see Ryder Yates again. Ugh, I still don’t know why I turned down that too-good-to-be-true boy who flirted with me when we were attending separate schools. But honestly, it wasn’t as bad as I thought it would be. It was worse. Who knew becoming lost in a new life could help a girl find her true colors? 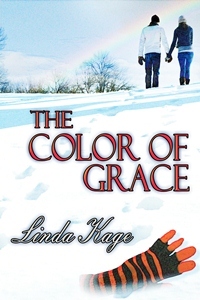 Linda Kage's The Color of Grace is fabulous! Kage's writing style flows easily and engages readers immediately. Grace is such an endearing character; it's so easy to become wrapped up in her life, her problems, and hopes. The Color of Grace walks readers through Grace's life just as she's about to begin a new one. Her mother just remarried and Grace must transfer to a new school nearby, which is also home to the player Grace embarrassed herself in front of at the last basketball game she attended: Ryder Yates. Grace doesn't slide easily into her new life as it's filled with challenges, some every teen faces at one point, and others no teen should ever experience. Grace is used to being part of a small group of friends, but in her new school Grace is virtually alone before her tentative friendship with the popular crowd. She learns that her new stepfather is known as the town's 'creep' and that Ryder Yates is more than a talented jock and the popular guy dating the head cheerleader. It seems as though the characters like Grace's mother, or Ryder, help shape Grace and give her the extra push she needs to see herself as she really is and who she can become. She's struggling to adjust to a new routine while the relationship with her mother is falling apart and she and Ryder are dancing a tango of attraction and misunderstandings. The Color of Grace is not necessarily a quick read, but Kage knows exactly how to keep readers engaged and fighting sleep to read just one more page! It's possible to finish the book in the same day of beginning the novel. Grace is a humorous character and speaks a language that teens and adults will understand. I would love to see more characters like Grace who can have fun while keeping serious matters at heart and who can see past themselves to the realities of life. The Color of Grace hits the spot in an appetizing showcase of Linda Kage's down-to-earth writing style. My final verdict is to not miss out on this highly recommended novel! Startled because he hadn’t shrugged me off for a loser and left, I jolted and glanced up to take in his purple and white Southeast uniform. He was number forty-two. I had no idea why that detail stuck in my head but it seemed easier to focus on his jersey than to look back into his too-beautiful-for-his-Southeast-jersey green eyes. He flashed his pearly whites with a knowing grin as if he realized exactly how awestruck I felt. “And you are…?” he prompted. My mouth opened. Then closed. Then opened again. Not a word came out. My vocal chords had failed me. The most handsome boy I’d ever seen wanted to know my name. As my brain wrapped around that fact, my thoughts fizzled and spurted out. That was the only word to flash in bright neon lights through my head. I needed to get out of there before he realized I was a nobody. “Not interested,” I blurted, more in a mummy trance than from actually thinking my answer through, because why, oh heavens, why I said not interested I still don’t know. I don’t know why but my young adult stories always seem to have one of those underlying after-school-special, moral-of-the-story themes to them. They’re not in your face tacky (well, I hope not anyway! ), but if you dig a little, you can find an ethical lesson under the plot. In The Color of Grace, the biggest moral of the story would probably be for all teenage girls to trust her natural instincts. You know not to enter the dark, creepy house with the broken-out windows and a shadow moving across the doorway. You know better than to follow the horny guy with that slick, scheming look in his eyes into a quiet upstairs bedroom during a rave party. Your gut is like the ultimate guard dog. When the threat of danger approaches, your nerves begin to tweak, your heart rate picks up, your palms grow a little moist. Your gut perks its ears and stares daggers at any kind of brewing mischief, maybe rumbles a warning growl under its breath (which probably feels a lot like indigestion). It’s up to you to pay attention to your gut though. Sometimes the glimpse of excitement can rule out your instinct’s internal warning system. And sometimes, things still end up okay when you go the risky route. But sometimes…sometimes you listen to your gut, you take the safe path, and you avoid major trouble. Back when my husband was a single young rebel, he used to go out partying with his buddies a lot. One night he decided he’d been overdoing it a bit and turned his friend down when invited to go barhopping. So while he stayed home and caught up on homework, his friend rolled his truck and lost a spleen. Listening to his gut instinct might’ve saved his life that night. Or maybe just his spleen. Who knows? For the most part, my heroine Grace listens to her gut and avoids a couple huge catastrophes, and sometimes…well, sometimes she doesn’t listen so well and she finds herself in a heap of trouble. Me, I’m one of those people who always (usually always) takes the safe path and I never do anything daring or risky. It’s kind of lame and boring, yeah, but I haven’t found myself stuck in any major disasters either. What about you? Do you listen to your all-knowing gut, or do you enter that creepy, old house just to find out what’s inside? Have you ever regretted the decision you made by either listening to or ignoring your internal warning system? Thanks for joining us today, Linda, and sharing your thoughts on gut instinct! Linda grew up on a dairy farm in the Midwest as the youngest of eight children. Now she lives in Kansas with her husband, toddler daughter, and their nine cuckoo clocks. She works a day job in the acquisitions department of a university library and feels her life has been blessed with lots of people to learn from and love. Writing's always been a major part of her world, and she's thrilled to finally share some of her stories with other romance lovers. fabulous review. Thanks for sharing!! Linda, it can be tough to trust your gut sometimes. Thank you, thank you, thank you for the lovely review! The post looks amazing! And yeah, I guess you'd have to go with the situation at hand before deciding about the whole gut-instinct thing! Great post. Sometimes we even go in that house when we're adults. Sigh. My one experience in a fake Halloween haunted house has me completely petrified of anything haunted these days. I was so freaked out, I somehow came running out of that house wearing another girl's necklace!! No idea how it happened!